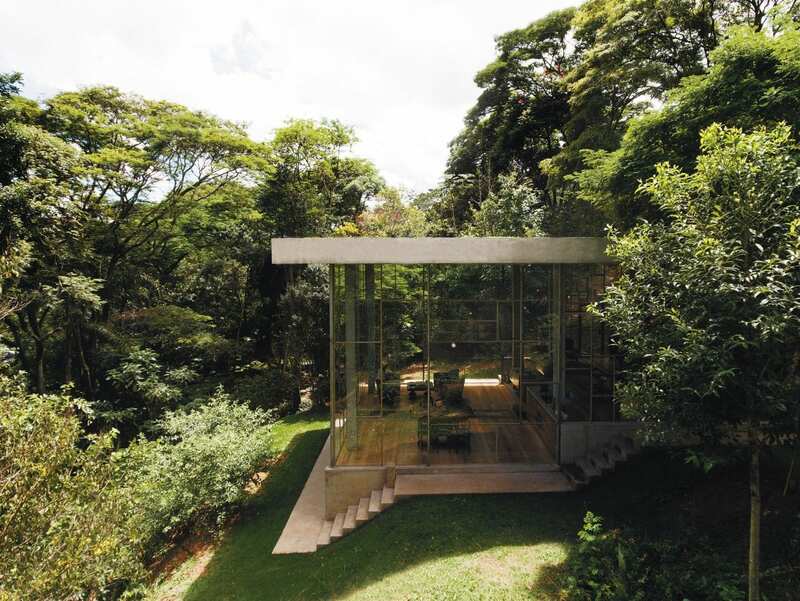 Casa Biblioteca or ‘Library House’ by Sao Paolo-based architects Atelier Branco Arquitetura is set in the small forest town of Vinhedo. A private commission for a Brazilian philosopher, the design revolved around fulfilling a brief for somewhere to think and read peacefully, and displays an impressive book collection. 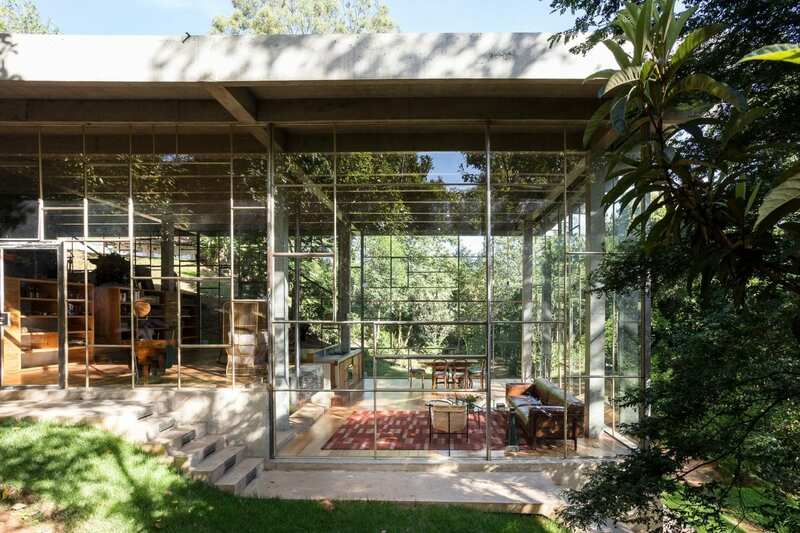 The client, a renowned political scholar and teacher at the State University since the 1980s, bought the house as a temporary haven between Sao Paulo and Campinas. 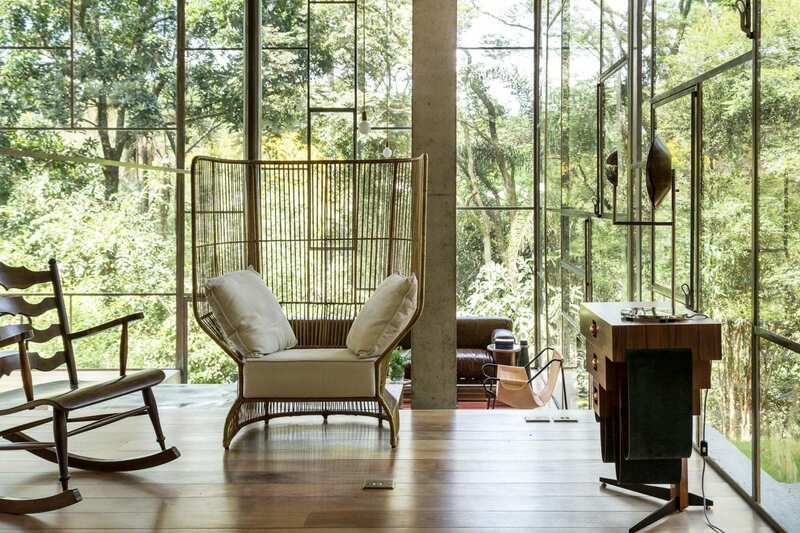 Rather than a permanent residence or ‘holiday home’ in the traditional sense, Library House is a place of reverie, contemplation, and occasionally work away from the bustle of Brazil‘s hectic metropolitan centre. 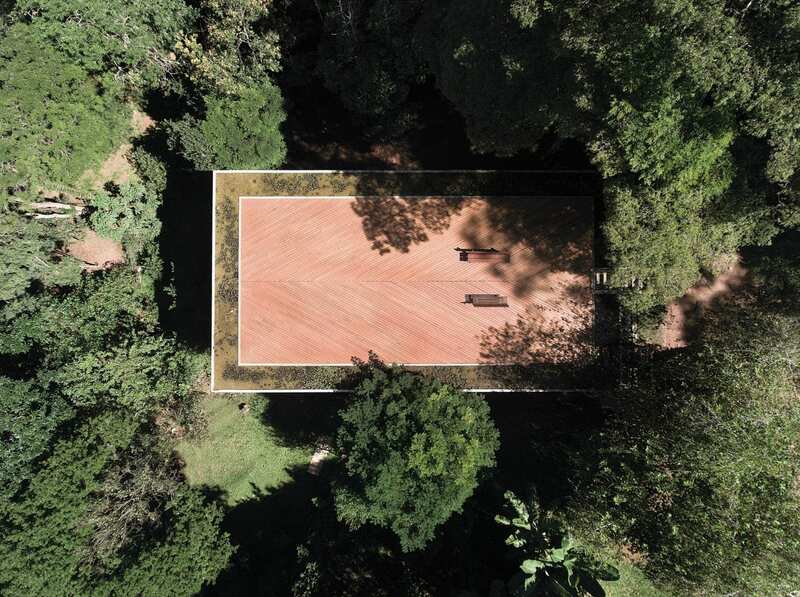 The 200sqm site is set atop steep north-facing terrain within a clearing amongst Vinhedo’s dense ‘Mata Atlantica’, the Atlantic forest that stretches throughout the country. 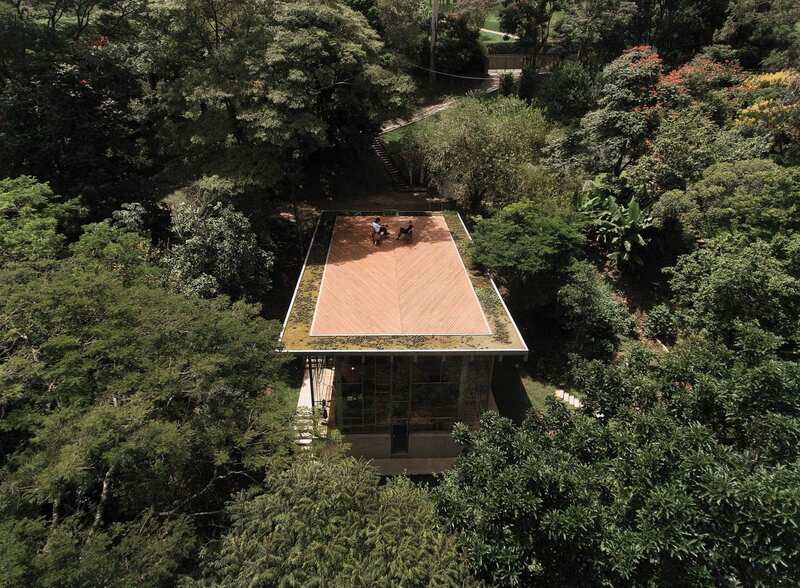 Two cast concrete slabs, one the base and the other the roof, form the principle structure of the house. 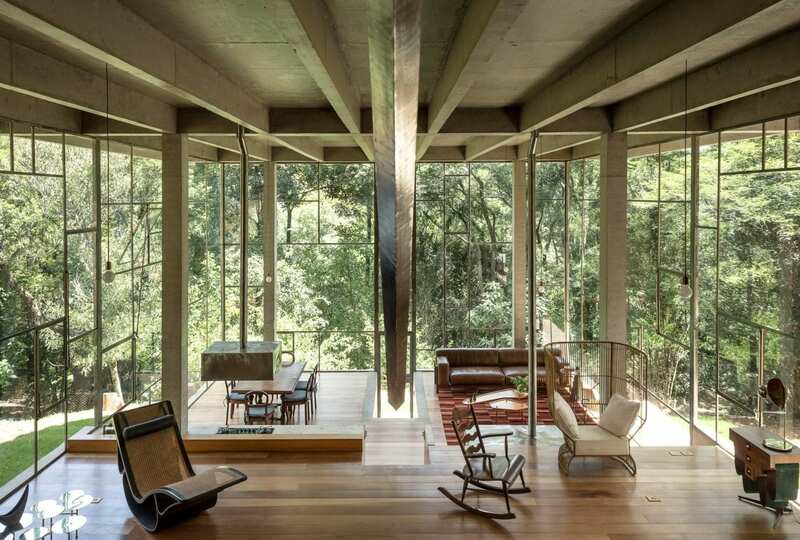 Eight slender concrete columns support this framework and are subsequently distinctive interior features. 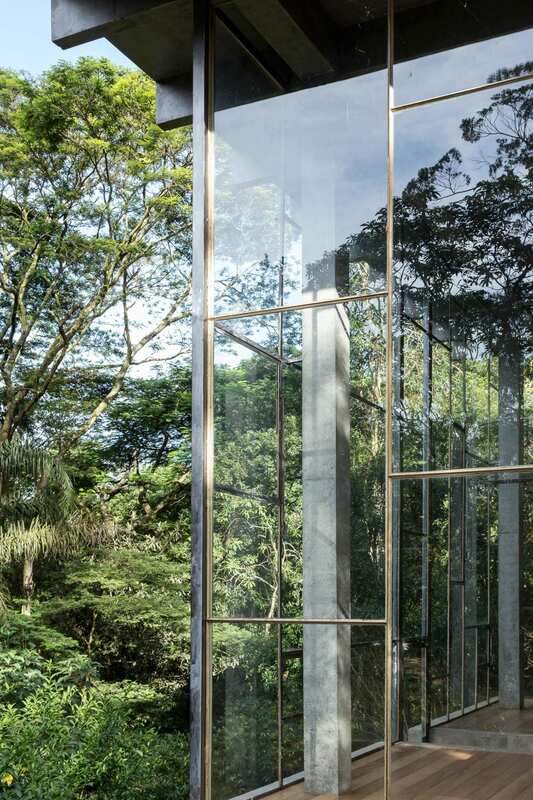 Full height Mondrian-style glass facades take full advantage of the verdant forest surrounds. Atelier Branco executed a vision of creating tree house nooks under one roof, encapsulating all domestic functions in an open space without dividing walls. Privacy and distinction between various areas are determined by differing elevation, with a staircase that runs directly through the middle of the house leading to three separate landings. 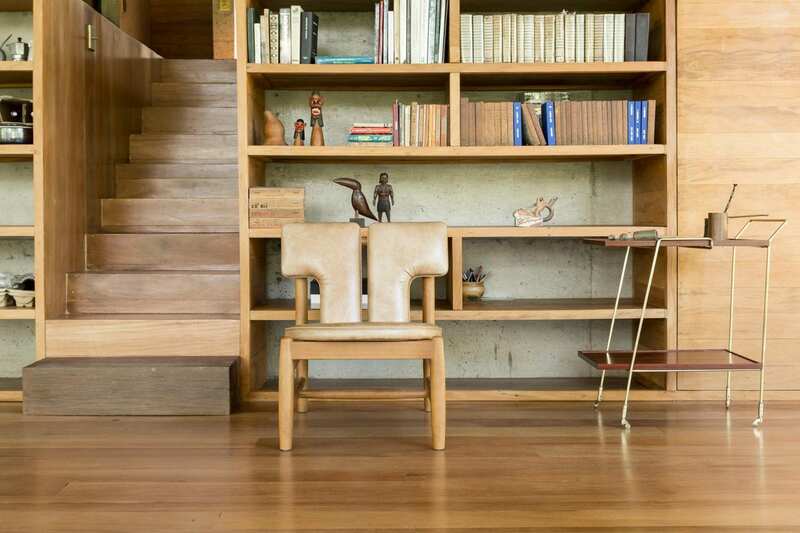 The second level features a built-in timber bookshelf that spans the entire east-west length of the space; making books the literal centrepiece of the home. 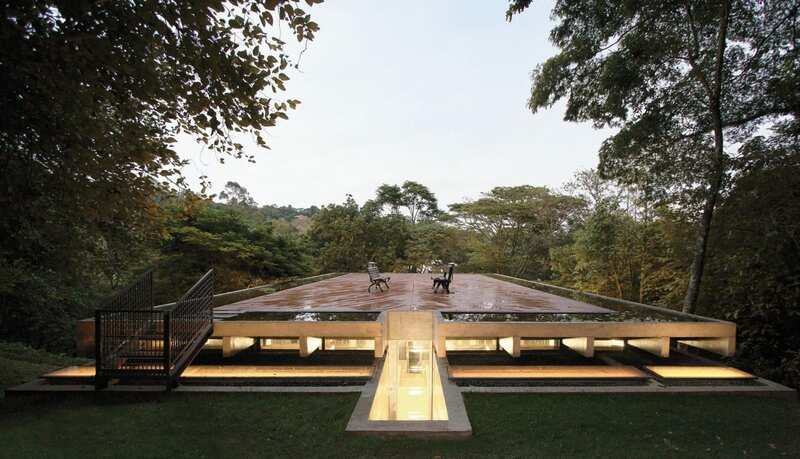 The perfectly straight, horizontal line of the roof juts out in contrast to the organic, sloping terrain around it. The concrete overhangs just beyond the uppermost retention wall, creating a prominent ledge that enhances a Brutal aesthetic, while also helping to shade the main living space from direct penetrating sunlight. Herringbone timber clads the roof’s exterior, creating a rooftop deck accessed via a small set of stairs. The roof is essentially at street level, with the rest of the house built into the slope below. 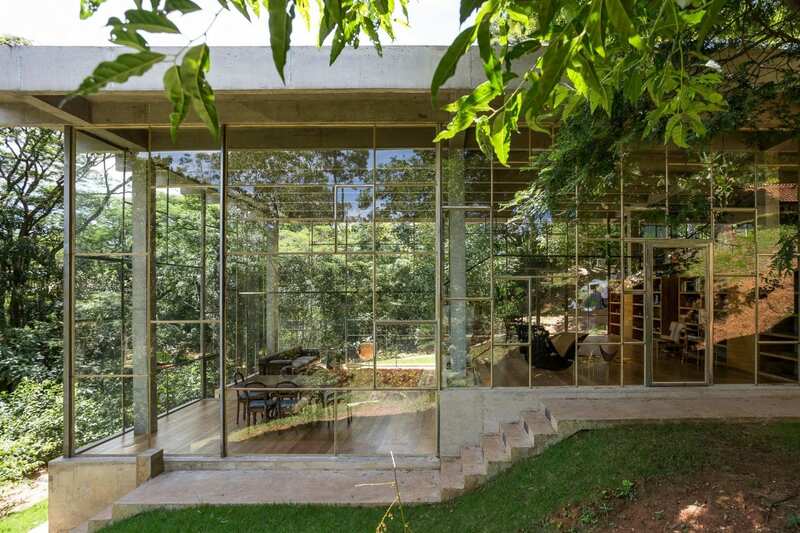 The post Library House (Casa Biblioteca) in Vinhedo, Brazil by Atelier Branco. appeared first on Yellowtrace.